Kilims are a type of Turkish rug made from interweaving the warp and weft threads of different colors to result in a flat-weave. With no knots tied onto the warp, and no resulting pile, the rug is often thinner and softer, lays flatter and can be used as a cover or wall-hanging, as well as area rug. Typically, in the basic form of the flat-weave, the cotton or wool weft threads wrap tightly around the warp threads, creating blocks of solid color. These different blocks may be separated vertically or diagonally, creating the thin ‘slit’ we see at changes in color. More intricate weaving techniques take a similar base, and by adding different threads over the weft threads, create more detail, pattern and styles that reflect the region or tradition from which they come. 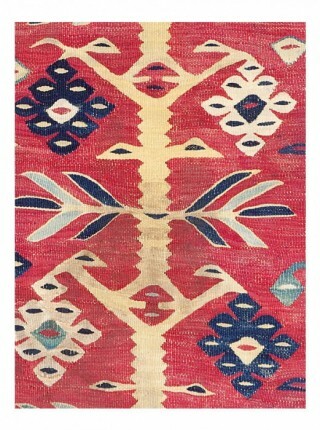 Turkish kilims and flat-weaves contain a wide range of colors and motifs, similar to traditional knotted Turkish rugs. The full range of symbols, from ‘hands-on-hips’ (elibelinde) to ‘ram’s horn’ and ‘tree of life’ are quite commonly seen on kilims and flat-weaves. While the method of weaving creates challenges of its own in forming the design and motifs, Turkish kilims can have quite detailed floral and animal designs, in addition to the familiar geometric shapes and patterns. 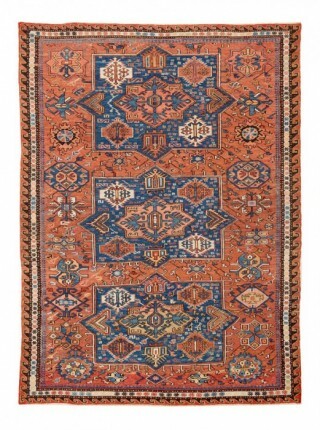 We have selected a few of our favorite rugs for display on here on our website, but we have many more kilims and flat-weaves, from bags to runners to door surrounds to wall hangings in our inventory. 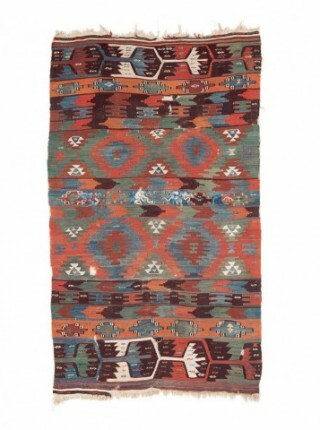 Esme kilims come from the town of Esme, in the Usak region of Anatolia. 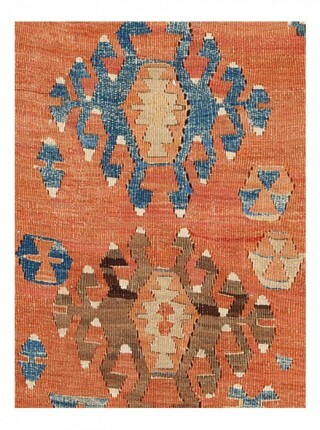 Made of wool and cotton, Esme kilims are unique in their use of soft pastel colors and pale wool. 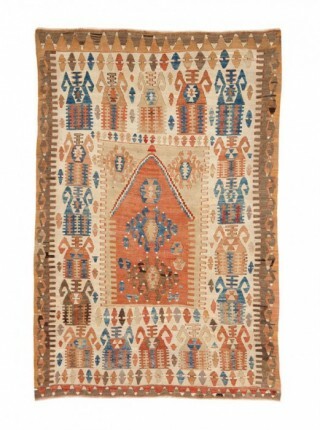 Each kilim tells a story through its use of color and pattern. Green symbolizes a wish, blue means hope and purple signifies grief in Esme kilims. 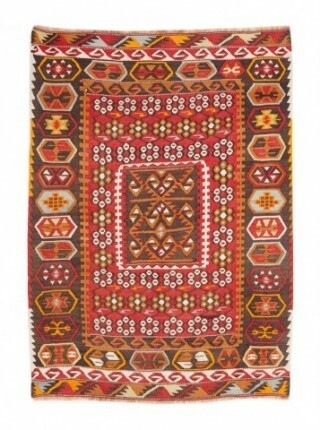 Elmadag kilims originate in the central northern part of Anatolia, near Ankara. The rich, dark colors are typical of this area. This lovely piece shows a detail in the center of ‘tuylu’, weaving longer loose strands into the tight warp threads to create a small decorative puff or flower across the center of the rug. 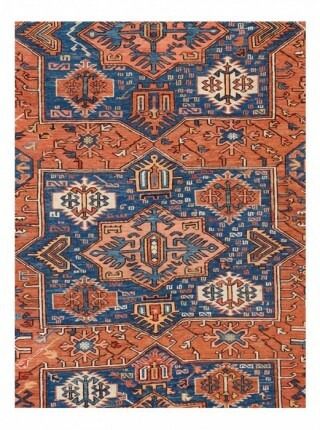 Gumurgen kilims come from the village of Gumurgen, in the Kayseri province in central Anatolia. The exuberant piece we have showcases how their bright colors and tightly woven geometric designs fill every centimeter of this kilim. 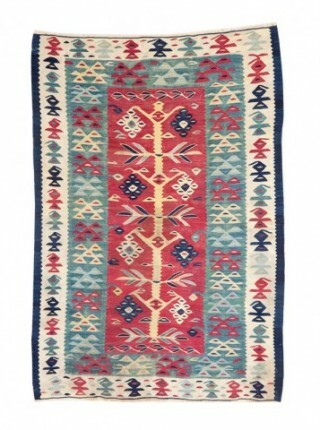 Sarkoy kilims and flat-weaves originate in design and production from the Balkans, and the term now includes kilim production in Bulgaria, Greece and areas in north-west Turkey near the borders with those countries. 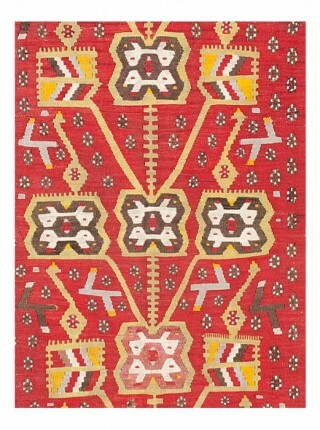 Sivri Hisar kilims come from an area west of Ankara. They are known for their stacked chimney forms. 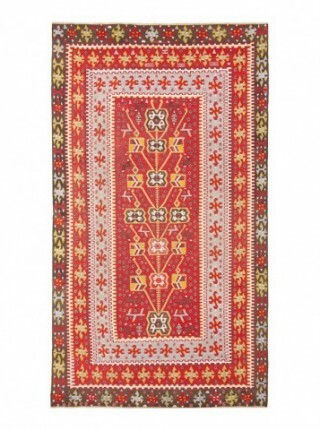 Our lovely piece is a prayer rug with stylized eli belinde and a row of chimney figures at the top. 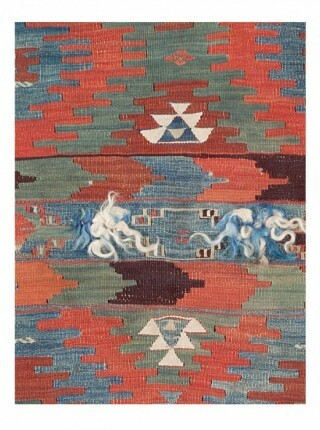 Sumak kilims and flat-weaves are in a different class of flat weaves, as they utilize a varied technique in the weaving. Weft threads are wrapped in different ways and patterns around the warp threads, and then tightly flattened, creating a wide variety of shapes and patterns in the thread itself. Typical motifs in Sumak kilims are taken from everyday life around us: plants, animals, objects of daily use such as vases or even vehicles. 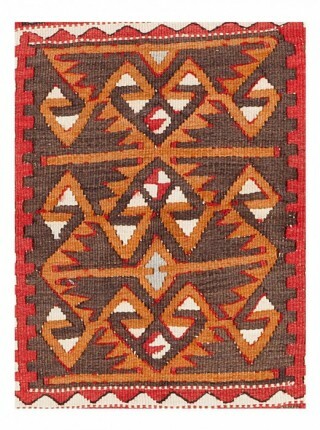 The combination of the weaving technique and the motifs depicted give the Sumak kilim a distinctive appearance, standing out from the traditional geometries of other Turkish kilims.